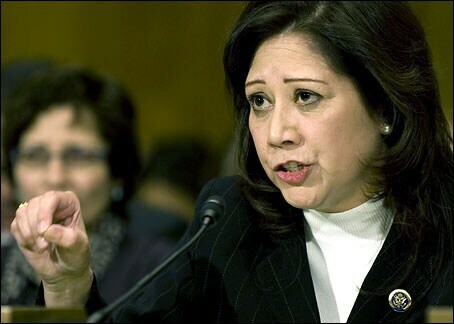 A Senate committee delayed its confirmation vote for Labor Secretary-designate Hilda Solis Thursday in order to review a potential tax controversy relating to Solis’s husband, two sources familiar with her confirmation said. CNN, Bloomberg and the Washington Post all filed reports. The Washington post said the comittee “abruptly canceled” its meeting. USA Today said Sam Sayyad paid $6,400 to settle tax liens against his business that were outstanding for up to 16 years. “Members on both sides of the aisle remain committed to giving her nomination the fair and thorough consideration that she deserves. We will continue to work together to move this nomination forward as soon as possible,” Massachusetts Sen. Ted Kennedy, chairman of the Senate Health, Education, Labor and Pensions Committee, said in a joint written statement with Wyoming Sen. Mike Enzi, R-Wyoming, the committee’s ranking Republican. The White House said the tax returns of its nominee to be Labor Secretary, Hilda Solis, are in order, adding that she shouldn’t be tarred by the tax issues of a business run by her husband. You are currently browsing the archives for the Labor Secretary category.